59 Productions was commissioned by director Lorne Campbell to design the set for Northern Stage’s gritty theatrical realisation of Get Carter. It is impossible to separate Lewis’s novel Jack’s Return Home from its roots in the North-East of England in the late 1960’s. 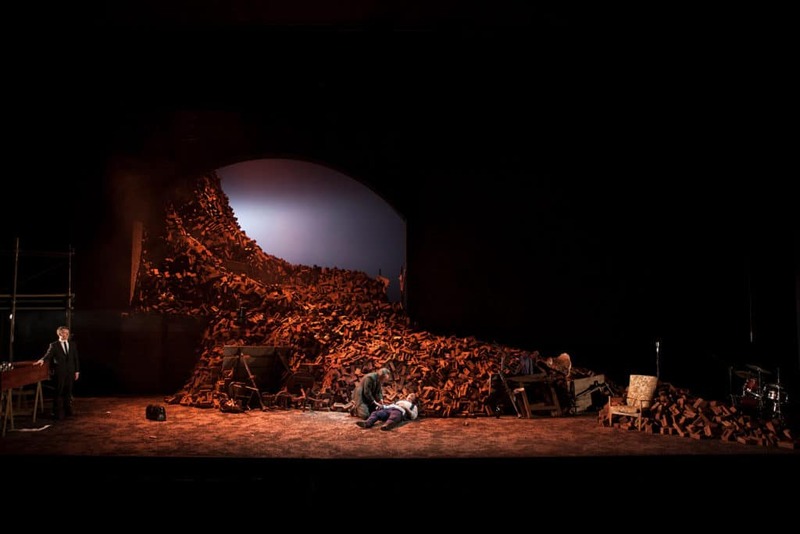 Inspiration for 59’s set design was drawn from Ted Lewis’s prose which is imbued with the textures, tones, sounds and smells of those landscapes and locations: the orange-red skies above the steel factories; the blackened buildings; the hard, dense, watery red of the clay bricks dug from the earth nearby and baked in the vast brick ovens. When Jack returns home from London for his brother’s funeral, he enters a world which he knows from childhood, yet which is inexorably changing under the influence of new seismic societal shifts brought about by money, power and politics. As Jack’s story ends – as we know it must – in his death and isolation, we see him embedded into this landscape of the North-East, returning somehow to the land from which he was wrought. In Torben Betts’ adaptation, the place where Jack and his brother Frank most like to play as children is also the place where he dies: amongst the detritus of the failing brick factories, stuck inside a defunct building, buried under an ever-increasing mountain of dank, heavy, stinking bricks, whilst outside “the rain rains”, as it always has. 59’s haunting set design for Get Carter takes this mounting pile of detritus and turns it into a symbol of the overriding sense of decay that surrounds the text. 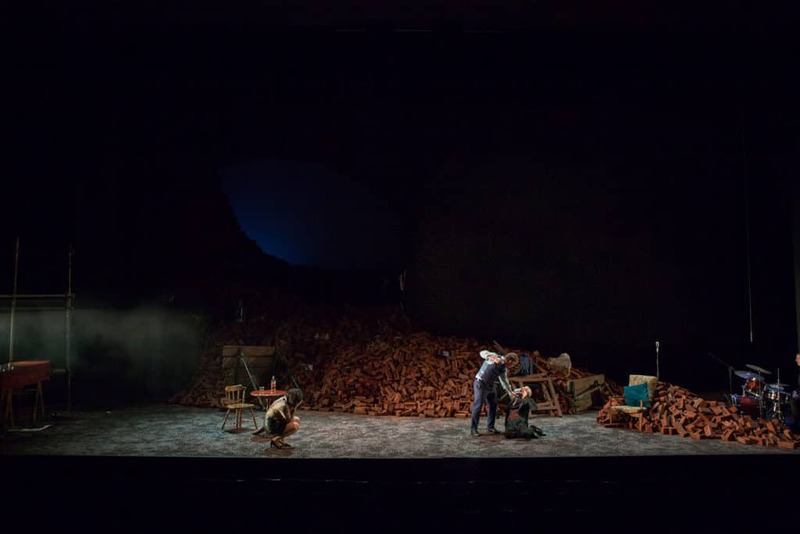 Flooding the stage with a wave of broken red bricks, the design gestures towards the wider themes of the piece without ever separating the audience from its material reality. 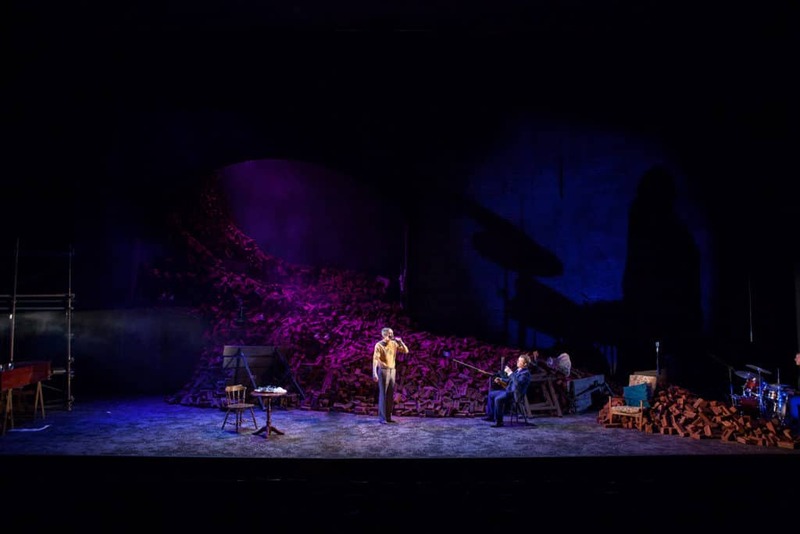 [59 Production’s] striking backdrop, a huge grey bridge that spews red clay bricks from its gaping mouth on to the shoreline of the muddy river, is suitably imposing.